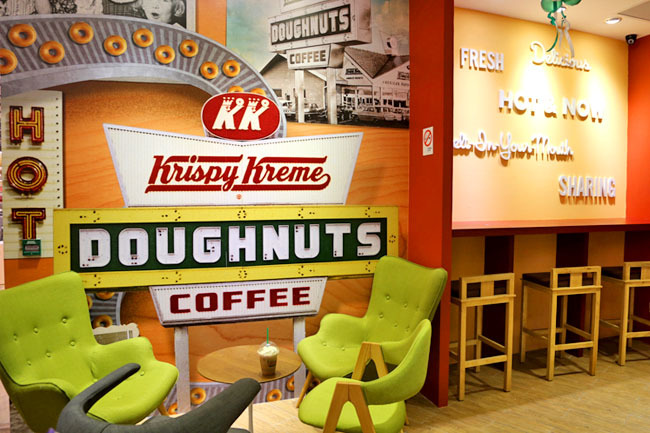 Kripsy Kreme Doughnuts, the 76 year old yeast-raised doughnut legacy, has finally opened in Singapore at Tangs Orchard. This is a long wait, considering Singapore wants to be 1st in everything, and there are Krispy Kreme outlets in almost all our neighbouring countries. The marketing cards were played right, and the queues were not unexpected. Lots of news covering the guy who won a year supply of Krispy Kreme. I hope he shares the donuts, because 624 Krispy Kreme could be 124,800kcal (200 calories for 1 original glazed) or a possible 16.2 kg weight gain. 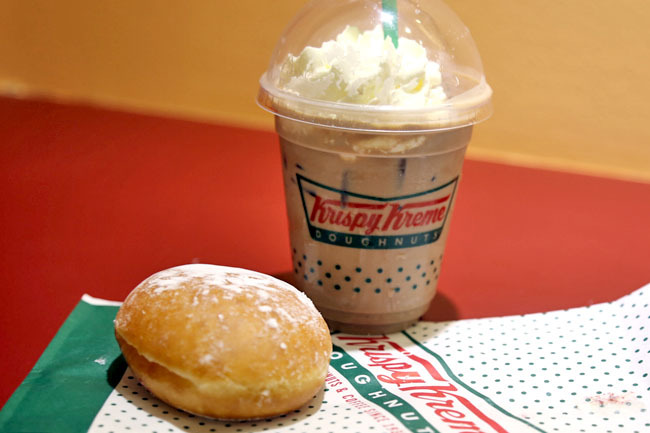 To get the record straight, I like Krispy Kreme – falling in love with it I took my first bite at Sydney years ago. The softness and fluffiness is quite irreplaceable by other donuts (or cronuts). I had Krispy Kremes in Japan, Hong Kong, Australia, Turkey, Malaysia, Korea and London. Crazy as it sounds, I got the media invite and free boxes, but I chose to go down to queue instead. Because I wanted to know how it feels to queue for one. 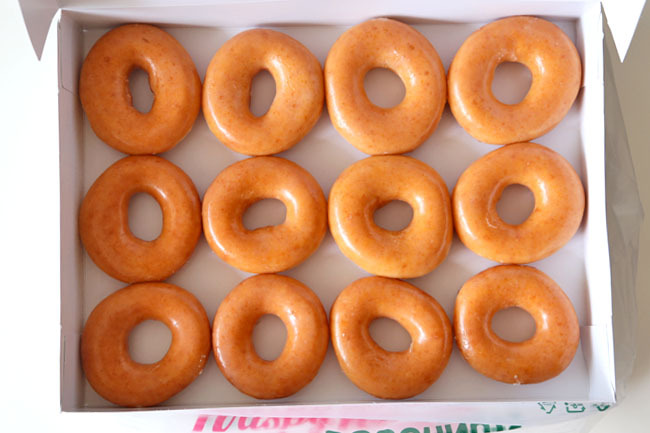 The Original Glazed ($2.90 for one, $23.40) remains the favourite of many. Assorted flavours are available ($2.95 each, $26.50), which includes Chocolate Iced Glazed, Almond All Over, Cookie Crunch, Chocolate Iced Custard Filled, Red Velvet, Chocolate Dream Cake and Cinnamon Apple Filled. Another factor that consumers are not too happy about is its price tag of $2.60, considerably more expensive than Malaysia’s RM2.90 ($1.14), Thailand’s 27 Baht ($1.10), Japan’s 160 Yen ($2.00) and even UK’s 1.20 pounds ($2.40). I can understand it due to the franchisee fees and Singapore’s high retail rental and labour cost. The queue was not an entirely pleasant affair, partly due to the underground works at Orchard which affected most of the tunnels which would have led to Tang’s basement. People were confused between the Normal and Express queues. The Express queue would allow you to pick up boxes of original or assorted without choosing, but there were no clear directions given by some staff. It took me about 20 minutes to get my donuts even though I was about 15th in the queue. The person queuing in front of me bought half a dozen boxes – for aunties, neighbours and friends “just in case”, while the person behind confessed he joined the line because he is “typical Singaporean”. How long would this “typical Singapore” mentality last? Unlike Tokyo’s flagship branch which had a 2-storey store with lots of comfortable seating area, the tight space and a couple of seats at this 1st branch meant the ‘café aspect’ is lost – I can’t really sit down to enjoy my donut with a chiller. 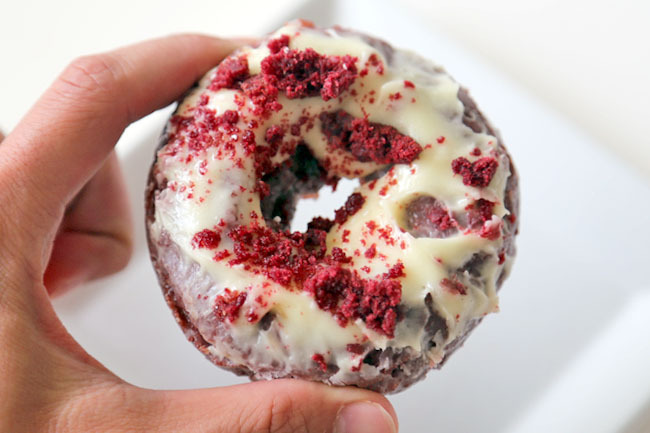 Donuts are not every day food, rather diabetic-inducing sweet, and something I would never feed children. Though an occasional indulgence does make you happy. 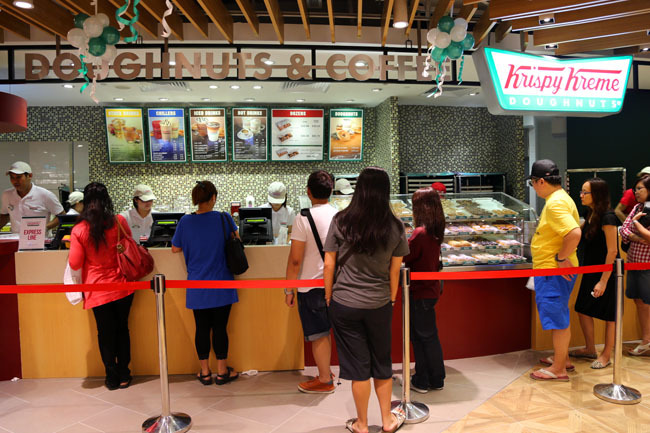 The challenge for Singapore’s franchisee is really what comes next, bearing in mind Hong Kong’s Krispy Kreme closed down in two years, and Krispy Kreme Australia went into voluntary administration with half of its underperforming stores shutting down for good. They all had that initial hype. Went to Brisbane just a week ago and I didn’t even bother to try. Perhaps because it is too common and normal (Its literally everywhere, even in 7-11)? The ones in Australia works out to be (they sell in dozens) about AUD$1.30 for a glazed one – even the mixed ones are about AUD$1.80 each in a box of 12. I wouldn’t have mind paying that amount but the prices in Singapore is just rubbish. It was way too sweet for me even in Seoul. That’s why I can’t even bother to try it I SG. Hi Daniel! 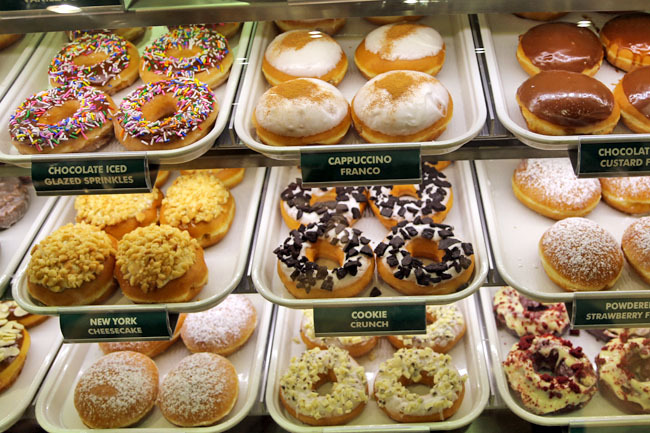 I was surprised when you mentioned the prices of Krispy Kreme doughnuts in your country. It’s way cheaper here in Philippines. I also find their doughnuts a bit too sweet. I’m actually contented with their original glazed. The queue in your country is better and shorter than what happened here years ago. The management was forced to limit the number of boxes a person can purchase to accommodate everyone. Unlike other privileged people, I admire your courage to experience the queue like a typical customer. Thank you for your review. I will love to give the donuts a try but not till the Q has died down. 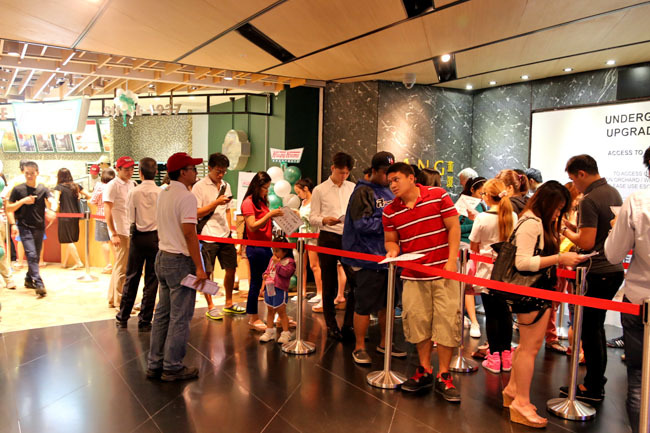 Do you remember that wasabi donut craze at Raffles City a few years back? I actually never tried it at all because there was always a Q. You have my vote for wanting to know what is it like to be in the Q by queuing up yourself. Good job! Again, I hate that every thing in sg is more expensive compared to our neighboring countries. $2.90 for a donut is a lot to pay for. It’s a sad thing that we continue to have to fork out more for overseas food brands. hi daniel, your first mention on the original glaze was $2.90. it should be $2.60. 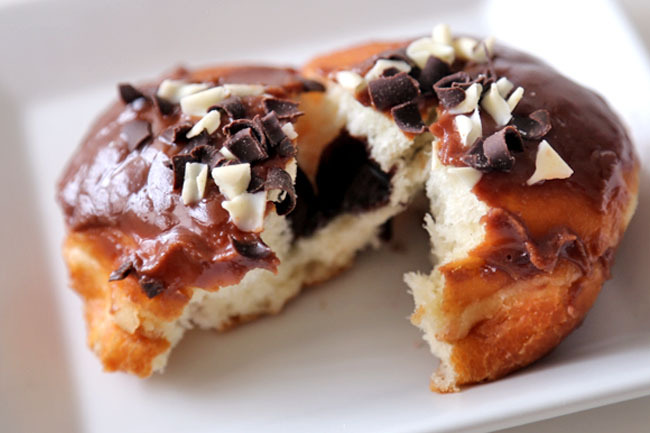 The texture is fine but the glaze and filling are way to sweet!! The texture is fine but the glaze and filling are way too sweet ! !